The Royal Scotsman is offering guests who book either a four-night Classic Journey or seven-night Grand North Western journey a complimentary, round-trip economy-class flight from New York, Boston, Washington D.C., Miami, or Chicago into Edinburgh for any 2012 departure date. Bagpipes, whiskey, Andy Murray – the thought of Scotland conjures a variety of images. There is no better way to see and experience all that the country has to offer than onboard Orient-Express’ The Royal Scotsman, the UK’s only luxury sleeper train. With the feel of a country house party and accommodating just 36 guests per voyage in comfortable, Edwardian-style carriages, it journeys through the heart of the Highlands. The train glides past sweeping glens, towering peaks, and black-mirrored lochs as the welcoming staff serves critically-acclaimed dishes showcasing the finest local ingredients and hand-selected wines. Now there’s even more incentive to travel on the train: The Royal Scotsman is offering guests who book either a four-night Classic Journey or seven-night Grand North Western journey a complimentary, round-trip economy-class flight from New York, Boston, Washington D.C., Miami, or Chicago into Edinburgh for any 2012 departure date. For more information on these journeys, please see below. The offer is valid until September 30, 2012. For full details, please visit http://www.royalscotsman.com/web/rs/special_offers.jsp. To book, contact Orient-Express Centre, The Americas, Trains & Cruises at 800-524-2420 or email greatjourneys@oeh.com. Highlights: In addition to visiting the most celebrated cities and historic sites of the Scottish Highlands, take part in a range of optional outdoor activities that include fishing, clay pigeon shooting, golf, woodland walks, and boat trips. Price: Rates start at $7,370 per person in a twin cabin. 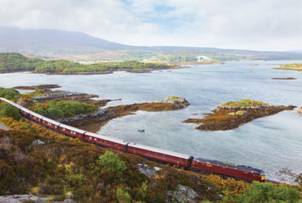 Highlights: With magnificent vistas of the Caledonian Canal and Loch Ness, the Grand North Western Journey boasts some of the most beautiful views in Scotland. Travel through the quaint towns of the Scottish countryside while pausing for tours of historic castles, distilleries, and glens along the way. Places of interest include the Bridge of Orchy, Glen Ord Distillery, Glamis Castle, and the renowned gardens of Ballindalloch Castle. Price: Rates start at $11,890 per person in a twin cabin. Journeys range from a quick two-night trip to a seven-night grand tour of Scotland. Highlights include visits to distilleries such as Dalwhinnie and to historic sites such as Mount Stuart House (Britain’s most spectacular Victorian Gothic house). Itineraries include The Highland Journey, The Western Journey, The Classic Journey, The Grand West Highland Journey, The Grand North Western Journey, and the Grand Tour of Great Britain. This entry was posted on July 20, 2012 at 3:35 pm and is filed under Uncategorized. You can follow any responses to this entry through the RSS 2.0 feed. You can leave a response, or trackback from your own site.